June is Pride Month, a time to celebrate the LGBTQ community. 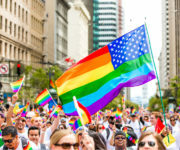 And while it has become a celebratory thing, it is important, especially in the current social and political climate, to remember that Pride Month did not start as a march. It did not start as a party. It did not start as a celebration. Pride Month commemorates the Stonewall Uprising. In 1969, while it was illegal to be gay, there were gay clubs. One was the Stonewall Inn in Greenwich Village, New York City. The police would raid it every so often. They would arrest the patrons. They would beat the patrons. And they would look the other way if the patrons were murdered. We are still here. You will not silence us. You haven’t been able to yet, and you never will. One day, a group of gay people, mostly trans women and street kids, mostly people of color, said “NO MORE!” and fought back. That started six days of riots, where LGBTQ people from all over the city converged in Greenwich Village and demanded their rights. To demand their lives!